PITTSFIELD, Mass. (CN) – Norman Rockwell’s three sons are fighting back in court against the Berkshire Museum’s plan to auction off 40 works of art next month, including two pieces from their famous father. “Shuffleton’s Barbershop” by Norman Rockwell. Thomas Rockwell, Jarvis Rockwell and Peter Rockwell – along with artist Tom Patti and Berkshire County residents James Lamme, Donald MacGillis, Jonas Dovydenas and Jean Rousseau – filed a lawsuit Friday in Berkshire County Superior Court to block the sale of the paintings, arguing it would violate the Pittsfield, Mass., museum’s mission. In July, the Berkshire Museum announced plans to sell 40 works of art worth tens of millions of dollars, claiming it is necessary to fund capital expenditures of $20 million and the creation of a $40 million endowment. The Rockwell sons’ lawsuit alleges that the museum contracted with Sotheby’s for a public auction in November before it announced its plans to the public, in breach of its fiduciary duties and without legal authority to sell the art. Artworks earmarked for sale include pieces by Rockwell, Alexander Calder, Frederic Church, George Henry Durrie, Albert Bierstadt and other artists. 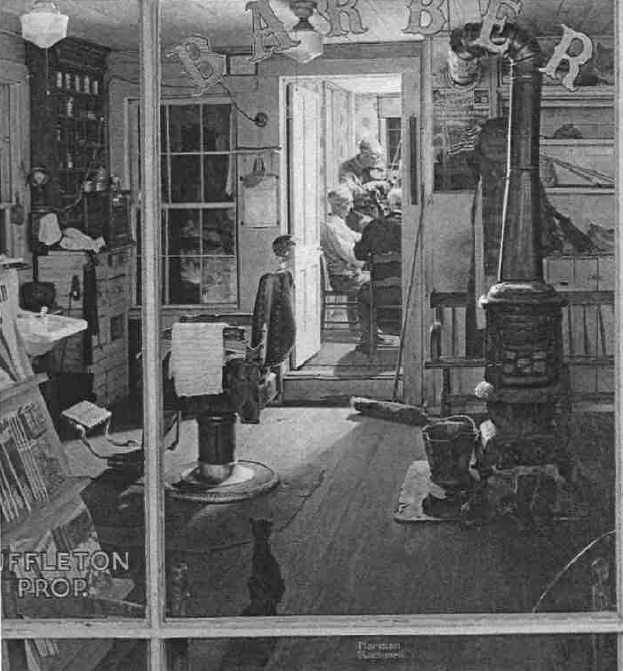 The two Rockwell paintings set to be auctioned off are “Shuffleton’s Barbershop” and “Shaftsbury Blacksmith Shop,” which Rockwell donated with the intent they be permanently displayed at the museum, according to the complaint. In addition to Keating, the plaintiffs are represented by former Massachusetts Attorney General Martha Coakley and Daniel McFadden, both Foley Hoag attorneys. A spokesperson for the Berkshire Museum did not respond Monday to a phone call requesting comment.